The Spins started in fall of 2002 when David Baron (piano/guitar/vocals), Gabe Davis (bass), and Ben Grant (drums) met as freshmen at Stanford University. Five years later, they recorded a self-titled EP and moved to San Francisco. Their first single, "Tell Her Something," won Best Music Video in San Francisco in Alice 97.3's 2006 3-Minute Film Festival. 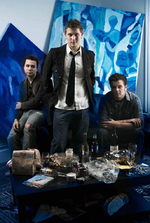 In January 2007, The Spins released their second EP, "Passages." Produced by grammy-winning producer Stephen Short, "Passages" features 4 piano-based rock ballads in the vein of Coldplay and The Fray. David, Ben, and Gabe are touring throughout 2007 in support of their new EP.